On Saturday, Aug. 7, the Sitka Conservation Society is offering a Tongass summer boat cruise as part of the Sitka Seafood Festival. This boat trip will be traveling to Medvejie Hatchery for a tour of the hatchery and a salmon bake provided by the Northern Southeast Regional Aquaculture Association (NSRAA). The trip will depart at 11 a.m. and return at 2 p.m. Boarding begins at 10:45 a.m. at Crescent Harbor. Tickets are $45 and can be purchased with cash or check at Old Harbor Books or at the Crescent Harbor loading dock at the time of the cruise. It is suggested that tickets be purchased in advance to assure participation. Food is not provided on the short boat ride to the hatchery, but hot beverages are complimentary. Binoculars are available on board for all. 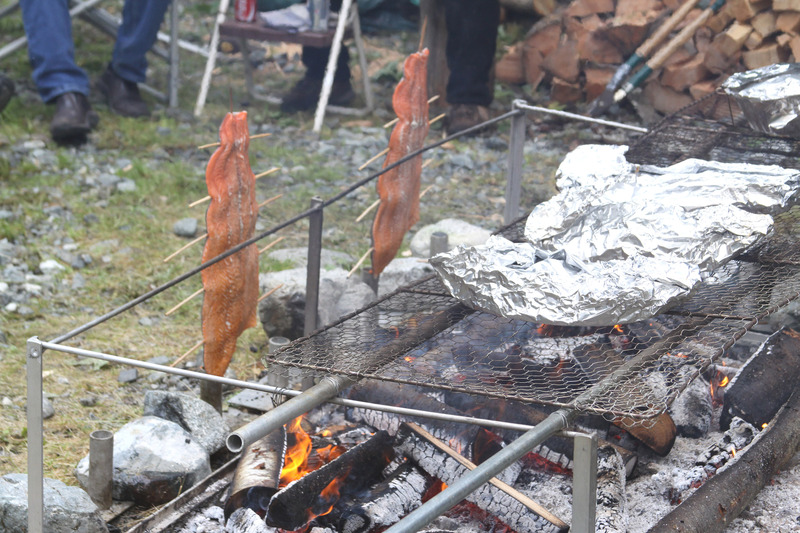 King salmon fillets and baked potatoes cook over an open fire at an open house and salmon bake hosted by Medvejie Hatchery on July 10, 2010. Allen Marine offers these boat trips at a reduced rate for non-profits. Please call 747-7509 or e-mail natalie@sitkawild.org for more information on this boat trip or others offered by the Sitka Conservation Society. The inaugural Sitka Seafood Festival takes place on Aug. 6-7 at the Crescent Harbor shelter, Harrigan Centennial Hall and other parts of Sitka. A tentative schedule of events is posted below. Feel free to print it out and post it on local bulletin boards. 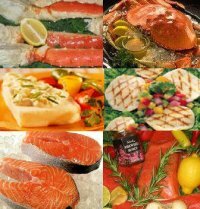 The Sitka Seafood Festival is Aug. 6-7, and the guest chef is Robert Kinneen of Orso Ristorante in Anchorage, who will prepare a gourmet seafood meal on Friday night with the assistance of several local chefs. Entertainment for the festival will be provided by the bluegrass band Trampled By Turtles (brought to Sitka with the help of Sitka Folk) and the four-man juggling, acrobatic, martial arts and comedy troupe “NANDA: Acrobaticalist Ninja Action Heroes.” The basic format of the event features a special dinner on Friday night with a variety of educational events, seafood booths and entertainment all day Saturday. Click on the poster link below for more details. Also, don’t forget the beer tasting and smoked salmon contest from 6-8 p.m. on Friday, July 30, at the Westmark Sitka. This fundraising event costs $30, and there will be live music, treats from Chef Jo, a variety of beers to sample from local distributors and a chance to win the prizes in the best smoked salmon contest. There is a $10 fee to enter the contest (which is deducted from your admission), and participants receive five pounds of salmon to smoke. For more details about the contest, go to the Sitka Seafood Festival site or contact Molly Andrews at (509) 953-9509 or molly@sitkawild.org. And don’t forget the Sitka Seafood Festival art and logo contest, so put on your thinking cap and send your camera-ready art entries to 411 Hemlock St., Sitka, AK, 99835, by Aug. 1. There will be a prize for the winning logo. Also, bring your seafood-, ocean- or marine-themed art to the art show Aug. 7 at Harrigan Centennial Hall. For more information, call Jeff Budd at 747-4821 or e-mail sitkaarts@yahoo.com. To learn more about the Sitka Seafood Festival or to volunteer to help on one of the committees, e-mail sitkaseafoodfestival@gmail.com. You also can contact Alicia Peavey at alaska_al33@hotmail.com or 1-928-607-4845. Volunteers still are needed, and some of the lists of duties are posted below with the current list of volunteers.